Plump and firm skin with a dose of this active-ingredient moisturiser. Super-charged with WildBerry Harvest concentrate for maximum hydration. Brighten skin with an intense boost of Vitamin C from Kakadu Plum, combat the first signs of ageing with Goji Berry and keep skin firm with the natural goodness of Coconut Water. Cocos Nucifera (Coconut) Water, Aloe Barbadensis (Aloe Vera) Leaf Extract, Aqua (Water), Glycerin, Glyceryl Stearate, Cetearyl Olivate (and) Sorbitan Olivate, Simmondsia Chine+Q104:S104nsis (Jojoba) Seed Oil, Glycerin (and) Aqua (and) Syzygium Luehmannii (Riberry) Fruit Extract (and) Tasmannia Lanceolata (Pepperberry) Fruit Extract (and) Kunzea Pomifera (Muntries) Fruit Extract, Butyrospermum Parkii (Shea) Butter, Theobroma Cacao (Cocoa) Seed Butter, Lycium Barbarum (Goji) Fruit Extract, Terminalia Ferdinandiana (Kakadu Plum) Fruit Extract, Euterpe Oleracea (Acai) Fruit Oil, Tocopherol (Vitamin E) (and) Helianthus Annuus (Sunflower) Seed Oil, Citrus Aurantifolia (Lime) Oil, Xanthan Gum, Potassium Cetyl Phosphate, Glyceryl Caprylate, Sodium Benzoate, Parfum (Fragrance), Benzyl alcohol. 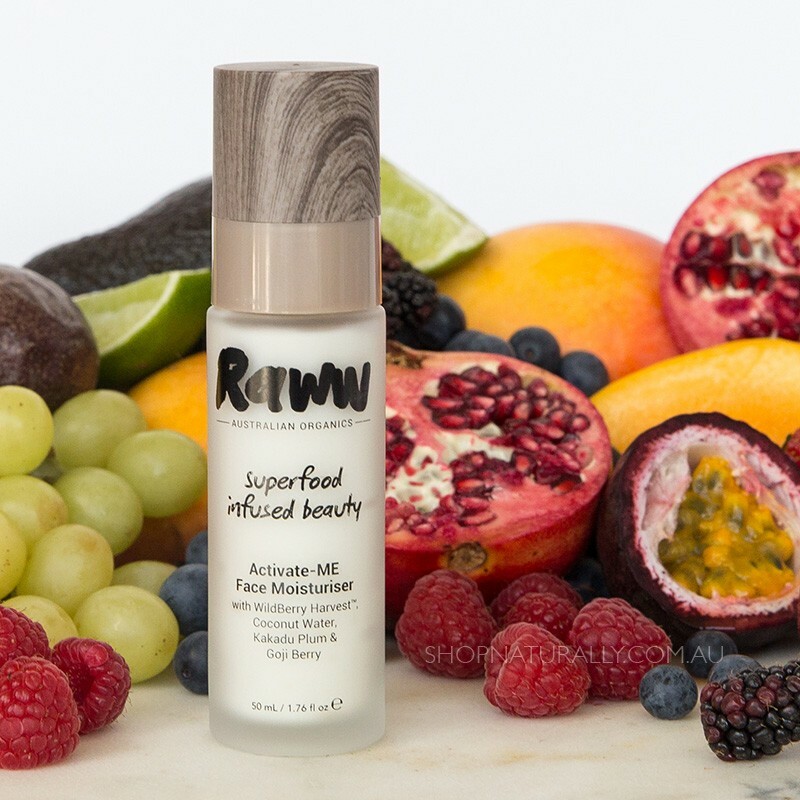 Raww Cosmetics are a fresh Australian brand using superfoods nourish and enrich their makeup and skin care range. Formulated for teen girls and 20 somethings, the range is simple, safe and effective with some fun colours thrown in to their natural lipstick and natural nail polish ranges.